Boy oh-boy, another Wine-Wednesday already with the holidays fast approaching it's time to uncork another Wine of the Week, one that will be the perfect accompaniment to your holiday festivities. In the WOW spotlight this week is a saucy little 375ml number from the find folks at Terra d' Oro, who is selling it for a mere $12, a price that will keep the home-fires burning a little warmer this year. 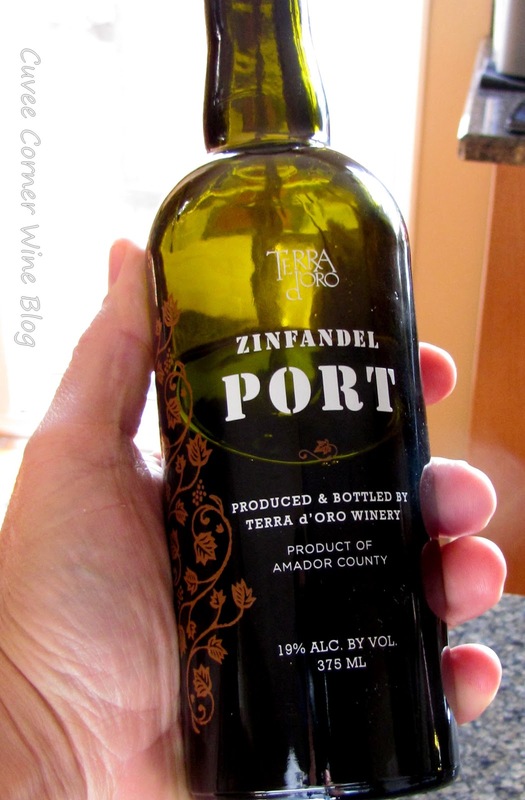 For you traditionalist in the audience yes you are right, Port is NOT normally made from the Zinfandel grape, though some producers Zins do attempt to reach those heights without fortification. Real "port" is is produced from grapes most folks can't pronounce [Touriga, Tinto etc], or remember what they are called and all start with the letter "T". But in this case it's Zinfandel Port all the way, fortified with brandy spirits and made in a ruby style. Sweet wines are really on the uptick these days and why not many Americans have a sweet-tooth, what better wine to fill that need than a tasty Zinfandel Port made right here in California. I've a couple friends who I remember saying to me, "Bill, uggh we don't like port" I then introduced them to a 20 year Taylor Fladgate and it blew their minds. Funny, they became Port converts that day and I think once most folks understand what it is and the kind of experience this type of wine offers, they will be hooked as well. I mean if you have to have an addiction to something, there are far worse things than having a Port addiction, if you know what I mean. What to pair? This is great question, for many folks the wine alone, is dessert enough and I totally get that as the RS on this style of wine clocks in around 97 g/l. But that said, here's a pairing option you may not have considered before, but one that is nearly as old as the history of wine itself [somewhat of an embellishment]. Here's my suggestion, grab yourself a farmhouse or farmstead Cheddar or the Mt. Tam from my friends at Cowgirl Creamery. Also the Cinnamon Crusted aged cheese from your local Trader Joe's is a master-stroke, trust me on that recommendation, you will thank me later. But if you like to pop the cork on this bad-boy after the Thanksgiving intestinal suicide, it makes for a great digestive and as a bonus pairs wonderfully with Pumpkin Pie. Now you're probably thinking "uh, that's nice Bill, but what does it taste like" good question. I of course have your answer that just may interest you. You can expect a Burgundy color in the glass, fresh but rich blackberry and cassis aromas jumping from the glass if you're one of those fancy swirl and sniff first kind of wine-snob. Or if you are the uncork, pour and slurp kind of person, you can expect to find a well knit structure type of canvas, over which velvety black fruits [think blackberry, bramble berry compote] and a nice nip of dark chocolate hanging around in the background. It weighs in with a healthy 19% abv, but you hardly notice till you glance at the bottle. Just in case you wanted to know or you're just the curious type, this bottle was sent as a sample for the review process. Until next time sip long and prosper cheers!